ECR Minerals plc (the “Company”) is a mineral exploration and development company incorporated in England & Wales. 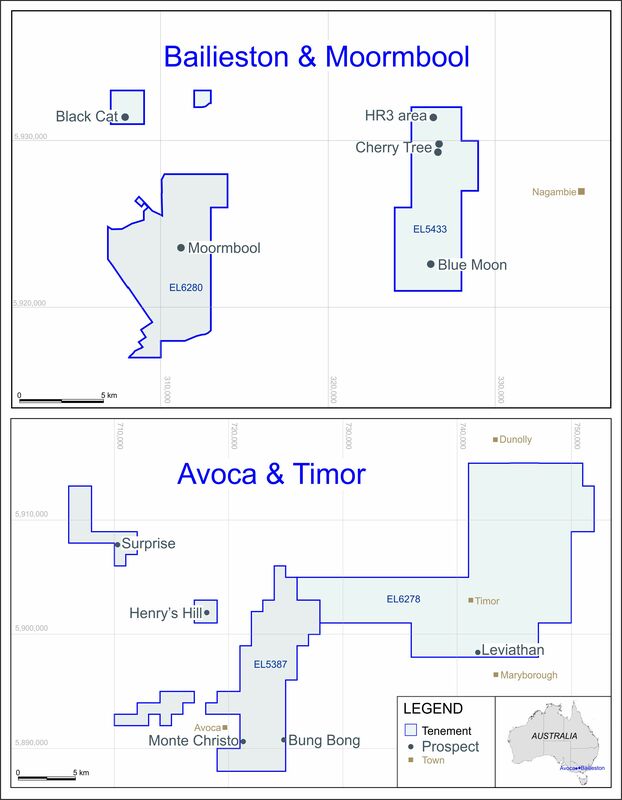 ECR’s wholly owned Australian subsidiary Mercator Gold Australia Pty Ltd has 100% ownership of the Avoca, Bailieston, Moormbool and Timor gold exploration licences in Central Victoria, Australia. Exploration for gold in Victoria is ECR’s current focus. A map of the Victorian licences can be viewed here. For the latest updates, please see our regulatory announcements. ECR has earned a 25% interest in the Danglay epithermal gold project, an advanced exploration project located in a prolific gold and copper mining district in the north of the Philippines. An NI43-101 technical report was completed in respect of the Danglay project in December 2015. ECR’s wholly owned Argentine subsidiary Ochre Mining has 100% ownership of the SLM gold project in La Rioja, Argentina. Exploration at SLM has focused on identifying small tonnage mesothermal gold deposits which may be suitable for relatively near-term production. ECR shares are listed on the AIM market of the London Stock Exchange with the symbol ECR. LONDON: 27 FEBRUARY 2015 - ECR Minerals plc is pleased to provide the following update on its activities. Following completion of the detailed geological mapping exercise carried out in the latter part of 2014, it is planned that bulk sampling will commence at the Maestro Agüero prospect in March 2015. The directors of ECR consider Maestro Agüero to be the most promising prospect at SLM on the basis of exploration results to date. The SLM project is 100% held by ECR’s wholly owned subsidiary Ochre Mining SA (“Ochre”). Ochre’s channel sampling at Maestro Agüero has demonstrated the presence of moderate to high gold grades in narrow mesothermal quartz veins over a strike length of up to approximately 300m. However, it is apparent that gold grades change abruptly along strike, which is indicative of a nugget gold effect. In order to obtain a more representative indication of grade, it is planned that a bulk sample will be taken at Maestro Agüero in March 2015. Collection of the bulk sample will also provide additional information on the morphology of the veins, and the sample itself will provide material which may be used for metallurgical testwork. A decision will be made as to whether to proceed with metallurgical testwork following completion of the bulk sampling. The JV-14 zone, where sampling in and around historical exploration trenches was carried out by Ochre in 2014, comprises part of a larger prospect area, the JV prospect, containing several other zones in which sampling, both historical and by Ochre, has returned high grades. The JV prospect is located approximately six kilometres south of Maestro Agüero. Subject to positive results from bulk sampling at Maestro Agüero, further geological mapping and channel sampling will be considered for the JV prospect. This work would be expected to enable a better understanding of vein continuity and grade distribution, and identify any priority zones for bulk sampling at the JV prospect. Further to ECR’s announcement dated 22 January 2015, diamond drilling is proceeding satisfactorily at the Itogon project, which is presently the Company’s main operational focus. Two of the seven holes planned have been completed to date, and the third hole is underway. Difficult ground was encountered by the first hole, but ground conditions for the second were significantly better, and this enabled an improved rate of drilling. Material drilling results will be reported when available. The contents of this announcement have been reviewed by Richard Watts B.Eng. Mining, Technical Director of ECR. Richard Watts is a Fellow of the South African Institute of Mining & Metallurgy with more than 40 years of experience in the mining industry. ECR is a mineral exploration and development company with, among other interests, the right to earn a 50% interest in the Itogon gold project in the Philippines. Itogon is an advanced exploration project located in a gold and copper mining district in the north of the Philippines. ECR has a 100% interest in the SLM gold project in La Rioja Province, Argentina, the exploration strategy for which is to delineate multiple medium to high grade, low tonnage deposits suitable for advancement to production on a relatively low capital, near term basis. ECR continues to review potential new investments on a highly selective basis, with a concentration on precious, base and strategic metals projects in Asia and South America. This announcement may include forward looking statements. Such statements may be subject to a number of known and unknown risks, uncertainties and other factors that could cause actual results or events to differ materially from current expectations. There can be no assurance that such statements will prove to be accurate and therefore actual results and future events could differ materially from those anticipated in such statements. Accordingly, readers should not place undue reliance on forward looking statements. Any forward looking statements contained herein speak only as of the date hereof (unless stated otherwise) and, except as may be required by applicable laws or regulations (including the AIM Rules for Companies), the Company disclaims any obligation to update or modify such forward looking statements as a result of new information, future events or for any other reason.